Tag Archives for " Fluoride Filter "
If you've been shopping for a reverse osmosis system, you know there are a lot of brands and models out there to choose from. Doing the research takes a lot of time, and it can get pretty confusing. I've owned a Berkey water filter for years, and I'm a big fan. Earlier, I wrote the Berkey Water Filter Buyers Guide covering all six models and how to choose the right one. But since the Big Berkey is the most popular one, I thought it should get its own post. 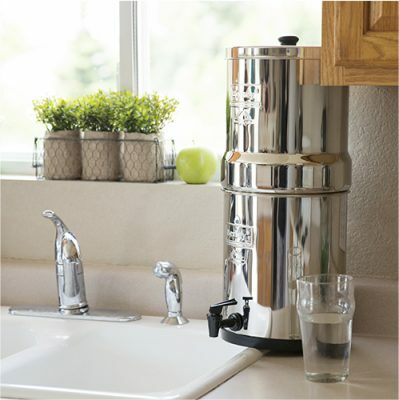 Are you considering buying a Berkey water filter? If so, you probably have some questions you want answered before you take the plunge. I've owned a Berkey filter for several years, and I've also done a lot of technical research on it. So I wrote this review to help you decide if it's the right choice for you. I'll admit it. I'm partial to Berkey water filters. I've owned one for over eight years now and I've been happy with it. It's the only brand of gravity water filter that I knew about when I bought it. But then I came across Propur, a brand that's been giving Berkey a run for the money. ​What's so great about gravity water filters? Plenty! They're simple to use and can give you a fresh ​supply of clean drinking water any time and any place. But how do you know which one is the best?​ There are so many to pick from these days! When I learned about the bad effects that fluoride can have on our health, I knew that I had to do something to protect myself and my family. Do you want to filter your water without going through the hassle and expense of installing a full-blown filtration system? If your answer is "yes", then you might want to consider a water filter pitcher. Are you looking for information about the new and improved Clearly Filtered water filter pitcher? Several of my readers asked me about the AquaCera water filter in the comments on my review of the best countertop gravity water filters. When I first wrote that review, I wasn't really familiar with AquaCera, but it was on my list of filters to check out.